In honor of my blog starting this day 5 years ago, I thought I'd share a kitchen feat I have been thinking about overcoming for a very long time. But first, we need to talk about the fact that I have been blogging 5 years already. That's a lot of food people. And a lot of picture. When I tentatively started this blog all those years ago, I never expected to be where I am now. I know, everyone always says that, but it is true. There has been a few times over the years I have considered stopping blogging. Mainly because I feel like I am just writing a personal journal that no one sees. So, what is the point of putting in all this effort to photograph my food and then write about it? But, I've come to realize over the years, despite not reaching my expectations of readers, that I have grown tremendously in the kitchen, all because of my blog. It has inspired me to cook different types of food, to go out of my skill level comfort zone, to really explore the cooking/baking world. As well as making some wonderful friends through the blogging world. Also, the whole website design thing has been quite the learning curve for me. I've changed hosts a few times, trying to find what works for me best. I don't hire anyone to help me, so it's been a bit of a difficult and frustrating journey, to say the least. I am always tweaking the site, mostly because I like change a lot. The photography on the blog, well, that has been monumental for me. If you look back in the blog to the early posts, the photos are...awful. I cringe looking back at them, and it makes me want to rephotograph all that food. I had a crappy camera, I was new to styling food and getting natural light to work for me. I have since then upgraded to a nicer, better camera, but I don't have any other equipment. Over the years, I've done a lot of reading online, and looking at other people's photos to see how they style their food and how they light their photos. That has helped tremendously, but I still struggle from time to time to get photos looking the way I want them to. Despite all the trials and tribulations I have endured through the last 5 years of blogging, I sit here today, really happy that I am still taking the time to photograph and write about the food I make. Sharing food, whether it be bringing a dessert to a friend for their birthday, or writing about food that I have made, tried, and loved, makes me beyond happy. So, here's to 5 years of mistakes, disasters, new friends, and a hell of a lot of good food, and a big thank you to all of you! I tend to ramble don't I? 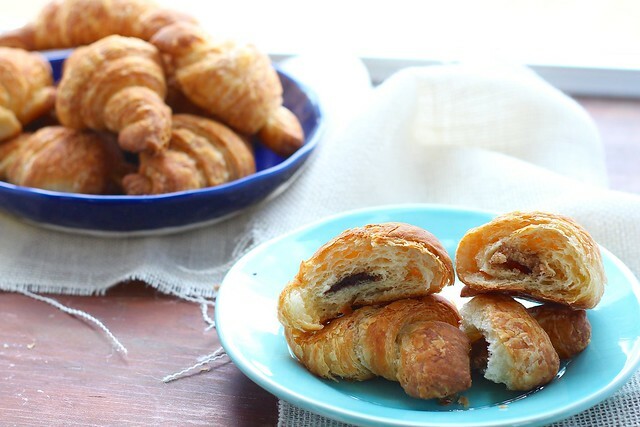 Now, what you have been patiently waiting for- croissants! I am super excited about these because, like I said before, I have been waiting to check these off my list for a loonnngg time. I have thought about them, thought about them and continued to think about them. Then one day, a week or so ago, I decided that I had thought about the damn things long enough. It was time I made them! Of course, I couldn't just make one kind either. I had to really make it difficult for myself, and make two flavors. Well, technically three if you count plain as being a "flavor". I decided that I needed to make chocolate too. Then the idea of almond paste popped into my head. 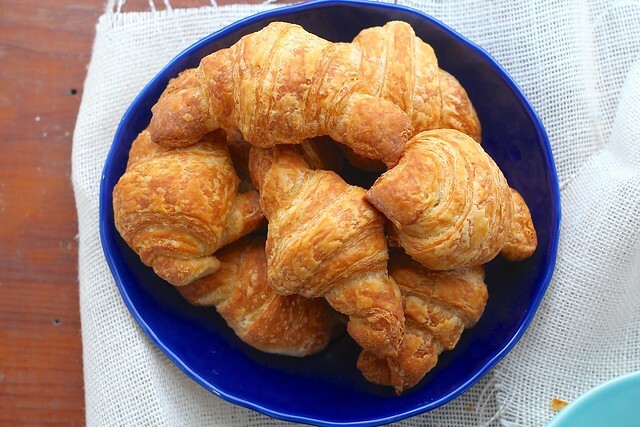 When I randomly decided to make croissants, I didn't have any almond paste on hand, so I scurried over to the computer to see what I could find. I mean almond paste can't be that difficult to make, right? Bingo! It was fairly straight forward. I still had to run to the store because I ran out of almond extract. So, I had to leave my house. You all know how that feels when you are hunkered in for the day. Ugh. These croissants were everything I had hoped they would be. 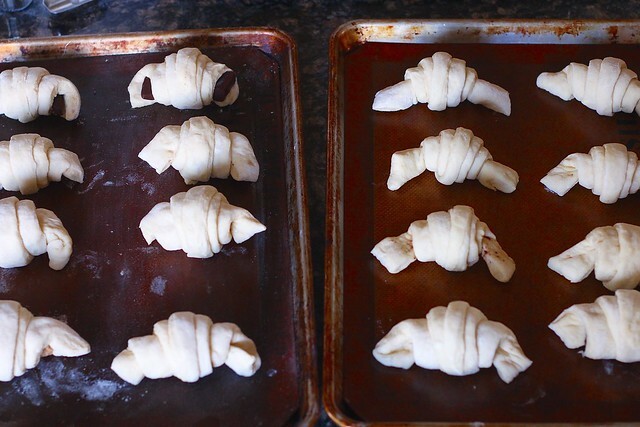 They were buttery, perfectly flaky, despite my weird shaping capabilities, and just down-right perfect. I tried all three kinds, of course. I couldn't pick a favorite, because they were all equally as wonderful. I know there are a lot of steps here, but I tried to photograph the more complicated-to-explain steps, in hopes that you won't be afraid to try making these yourself. 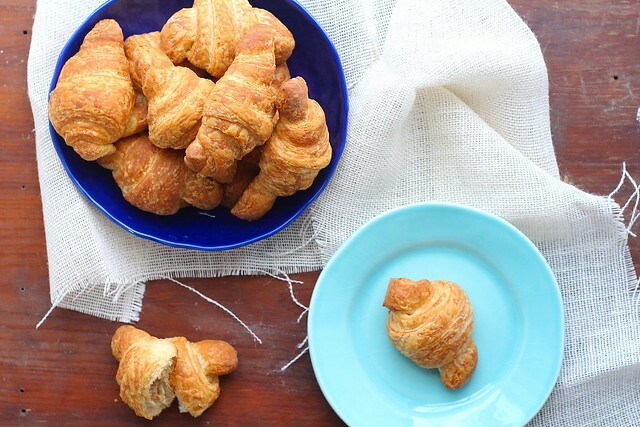 Since this recipe makes a lot, you can actually freeze the croissants after shaping, but before baking. I am so excited to have these checked off my "to-do" list, so that means you need to check it off too! Set some time aside this weekend, give these a go. Then sit down with one, or two, or maybe three with a large cup of coffee, breathe and enjoy all your hard work. To make the dough, whisk together the flour, salt, sugar and yeast in the bowl of a stand mixer fitted with the paddle attachment. With the mixer on low speed, pour in the milk, water and butter, and mix for 1 minute on low speed. The dough should be coarse and shaggy. If it's too wet, then add a little more flour. Or if it's too dry and stiff, stir in a little water. Increase the speed to medium-high and mix for about 20 seconds. Once again, adjust flour or water as needed. The dough should be smooth, but still soft and tacky. Turn the dough out onto a lightly floured surface and form into a ball. Place in a large, greased mixing bowl and cover with plastic wrap. Let rise at room temperature for 2 hours. Meanwhile, make the butter block. Cut the cold butter into about 16 pieces and place in the bowl of a stand mixer with the flour. Using the paddle attachment, mix on low speed for about 1 minute. Scrape the bowl and increase the speed to medium-high. Mix until all the butter chunks are gone and it is smooth. Line a small pan with parchment paper and spray with oil. Place the smooth butter in the center of the parchment paper. Lightly spray the top of the butter block with oil and cover with a large piece of plastic wrap. Press the now covered butter block down with your fingers to form a 6-inch square. 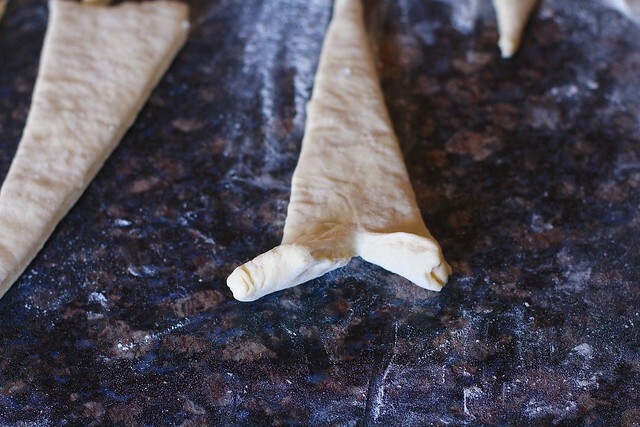 If needed, use a pastry scraper to even off the corners and sides. You want a nice squared-off block with a smooth top. Place in the refrigerator for 10 minutes to cool the butter down. When the dough is ready, flour a large work surface. 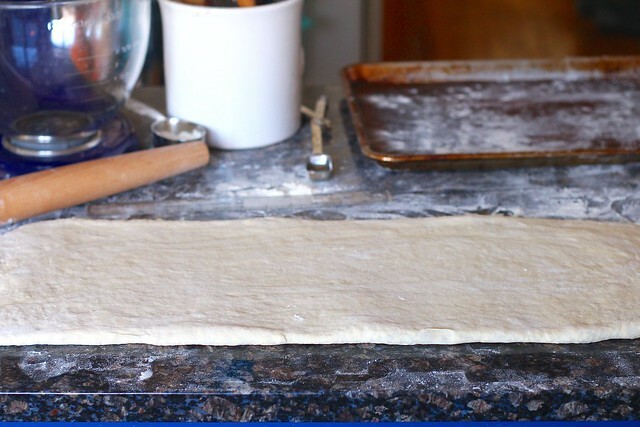 Turn the risen dough onto the floured surface and gently roll into a rectangle that is about 12 1/2 inches wide and 6 1/2 inches long. Square off the corners and sides with a pastry scraper. Lift the parchment with the butter block and set it down on the dough on the left side to check the size. 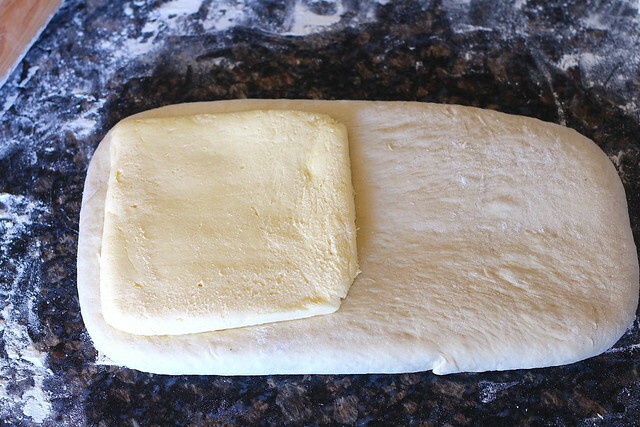 The butter block should cover only half of the dough with a 1/4-inch boarder on the sides. 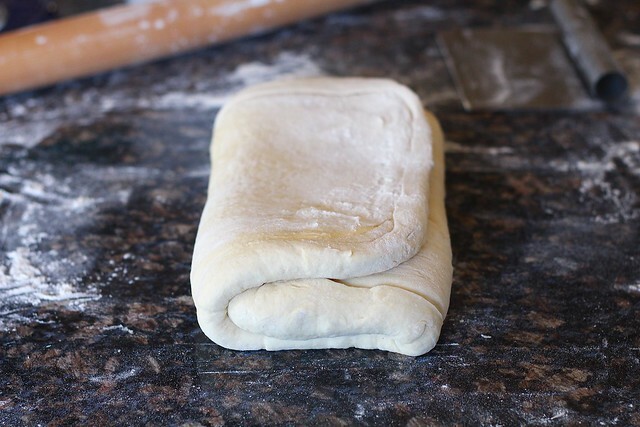 Roll the dough out a little more if necessary. 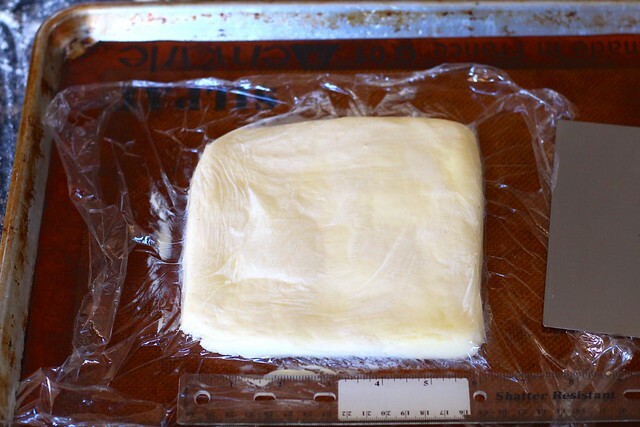 When the butter block fits, remove the plastic wrap and flip the butter block onto the dough on the measured side. Then, lift the right half of the dough and fold it over the butter block to sandwich the butter. Stretch and the pinch the seams together to seal the butter inside. You now have three layers. 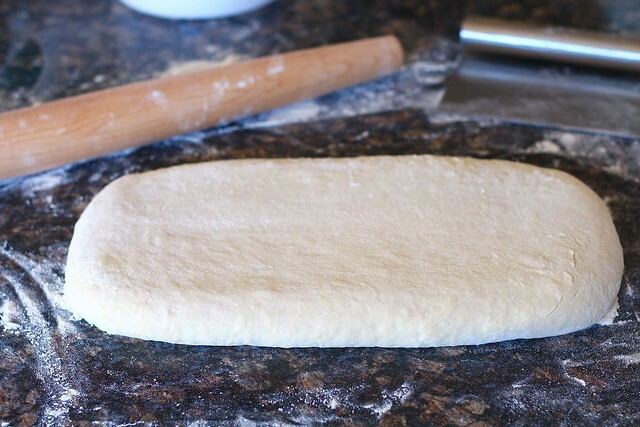 To laminate the dough, make sure your work surface is still well floured. Lightly dust the top of the dough with flour and gently, evenly roll the dough into a rectangle that is about 16 inches wide and 9 inches wide. Square off the sides and corners. 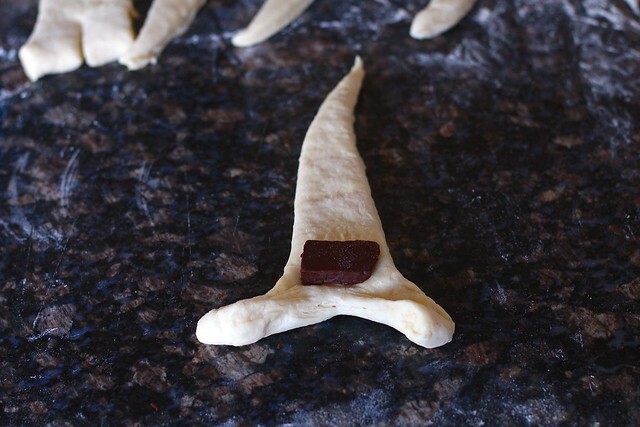 Then, fold the dough as if you were folding a letter. 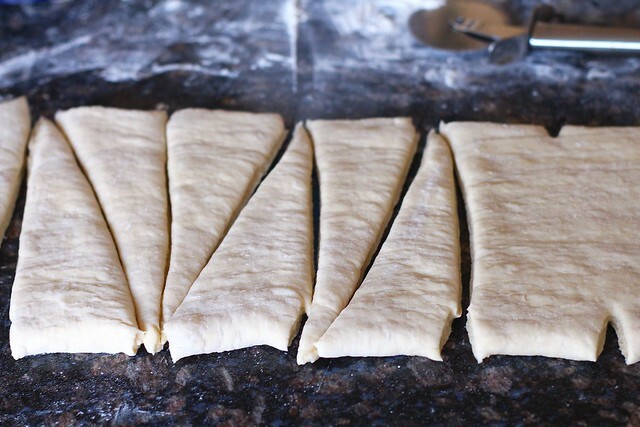 Fold the right side of the dough 1/3 of the way to the left, and fold the left side of the dough over the right side. 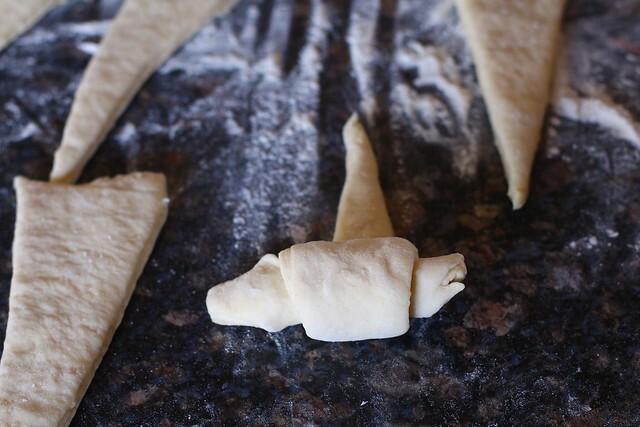 Use the rolling pin to press out any air pockets that may have formed. 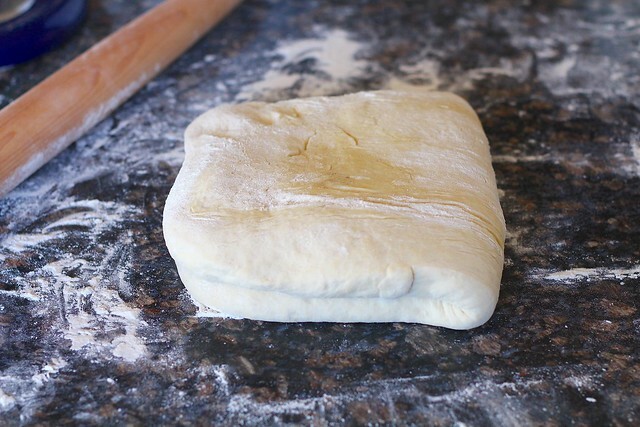 Carefully transfer the dough to a lightly floured baking sheet and cover loosely with plastic wrap. Let the dough rest at room temperature for 15-20 minutes. If the butter is getting too soft, place the pan in the refrigerator for the resting time. After the resting period, transfer the dough back to the floured work surface with the open seam facing away from you. 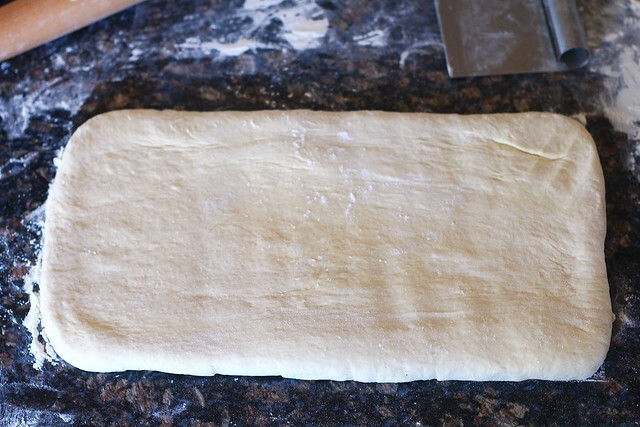 Gently roll the dough to a rectangle that is 16 inches wide and 9 inches wide. Fold it into thirds again. Transfer back to the floured baking sheet, cover with plastic wrap and refrigerate for 20 minutes. You now have 81 layers of dough. Meanwhile, make the fillings, if you are using them. To make the chocolate, have ready a cookie sheet lined with silpat or parchment paper. Melt the butter in a medium saucepan. Turn the heat to low and stir in the chocolate. Stir until the chocolate is melted and smooth. Pour the melted chocolate onto the lined cookie sheet, and using a spatula, spread the butter into a rectangle that is about 1/2 inch thick. Let cool until solid at room temperature or in the refrigerator. To make the almond paste, place all the ingredients in the bowl of a food processor. Process until smooth. Refrigerate until ready to use. Freeze any leftovers for several months. 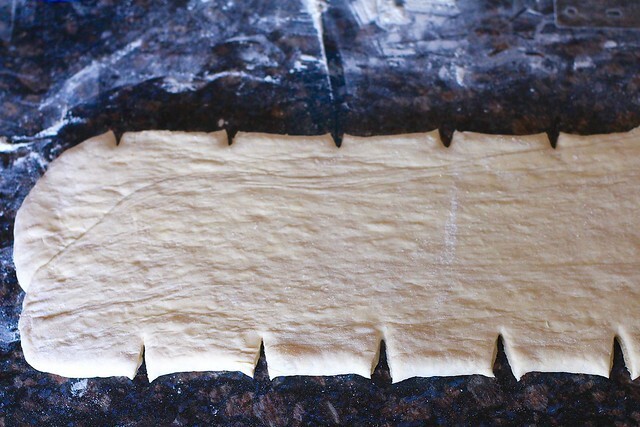 For the final roll-out and shaping, transfer the dough back to the work surface and gently roll into a rectangle that measures 32 inches wide by 7 inches long. Square off the sides and corners. 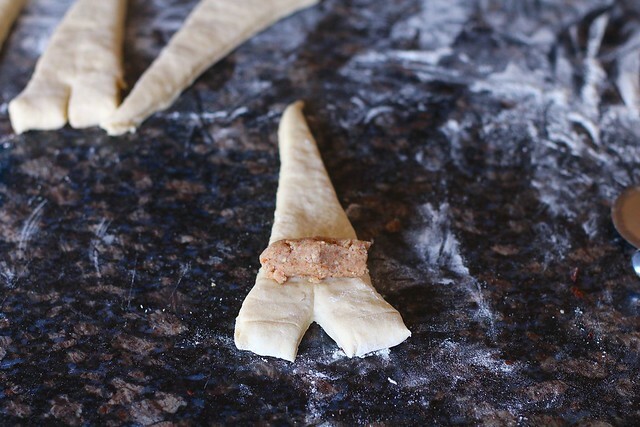 To make crescent shaped croissants, measure and notch the long side closest to you at 3 inch intervals. Do the same at the top, but start the first notch at 1-inch, then proceed with notches every 3 inches. Using a pizza cutter or metal pastry scraper, Cut a line from the bottom left corner notch to the top left corner notch to create a triangle. Once all the triangles are cut, cut a 1-inch notch in the bottom center of each triangle. Spread the bottom as wide as the notch will allow to create flaps. Starting with the spread flaps, roll the dough up jelly log style, gently pulling the tip of the triangle as you roll towards it. If you are using the chocolate and/or almond paste filling, slice the chocolate block into rectangles about 2 inches long and 1 inch wide. Roll about 1 tablespoon of almond paste into a rough cylinder. Place the fillings right above the notched triangles. Roll as directed above. 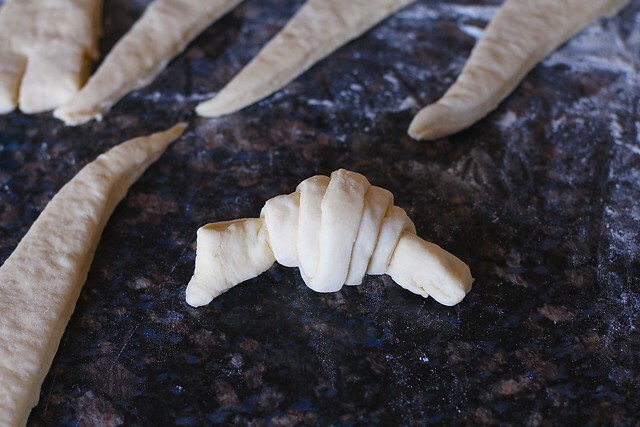 *Place the rolls croissants on a cookie sheet lined with parchment paper or silpat, spacing about 1 1/2 inches apart. Cover loosely with plastic wrap and let rise at room temperature for 2 1/2-3 hours. They should noticeably rise, but not double in size. Preheat the oven to 450ºF. 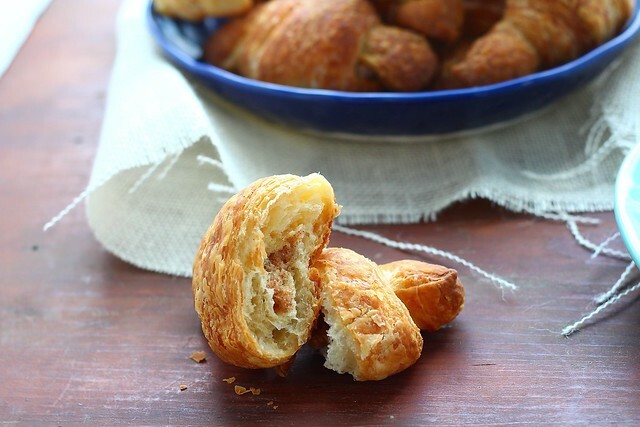 Place the croissants in the preheated oven and lower the temperature to 375ºF. Bake for 15 minutes, then rotate the pans and bake for another 15-20 minutes, or until the croissants are golden brown on all sides. If they begin to burn unevenly, lower the temperature to 325ºF. Remove from the oven and let cool for at least 45 minutes before devouring. *At this point, the croissants can carefully be individually wrapped in plastic wrap, put in a ziplock bag and frozen for several months. 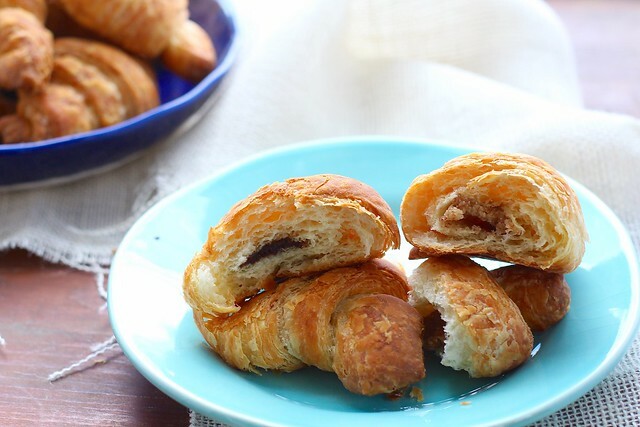 To bake after frozen, remove the frozen croissants to a lined baking sheet and let sit at room temperature for 3 hours before baking as directed above. ** As always, measuring your ingredients yields much better results. So, I would recommend grabbing or buying yourself a digital scale (you don't need a super expensive one).